1. Fry the garlic and onion until golden brown in the oil, add the shark, tomato, chipotle chiles, cilantro, orange juice, and leave to cook until the shark flakes at the touch. Mix up and season to taste. Place filling into the tortillas and roll up into burritos, garnish with lettuce. 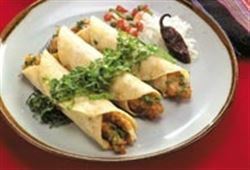 Enjoy this delicious burrito Mexican recipe!